Information and links to suppliers of dog training equipment, gundog training services and accessories such as dog beds and bedding. Specialise in selling high quality products including dog beds and bedding, travel crates and training equipment at affordable prices. Specialists in gundog training for the shooting field. Run by Graham Gibson, winner of field trials with Labradors, Spaniels and German shorthaired pointers. Located in Scotland. A range of award winning dog beds and loungers made from tough, durable and strong water resistant fabric which is impervious to dirt. Hygenic and comfortable for your dog. Quest offer a growing range of gundog training equipment designed, tested and manufactured by gundog trainers for gundog trainers. 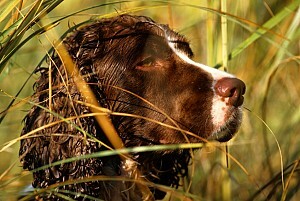 Specialist production of gundog training videos for English Springer Spaniels, Labrador Retriever, Cocker Spaniels, German Pointers and Flatcoats - films in video or DVD format.